American silver eagles have been popular among investors since the U.S. Mint first began striking these bullion coins back in 1986. What helps makes American silver eagle coins so attractive is that they’re affordable for just about anybody who wants to get in on stocking away precious metals. You have the liberty to buy these coins individually or in bulk, and you can purchase virtually as many as you want. The one ounce of .999 fine silver content in each silver eagle coin is also guaranteed by the United States government – a factor that only helps add to the popularity of these coins for investors around the world. When it comes to investing in American silver eagles, it’s important to realize that they’re worth approximately whatever the spot price of silver is per ounce. In other words, bullion versions of the American silver eagle (there are collector specimens, too) will fluctuate in value according to the daily ebbs and flows of the silver bullion market. So, silver eagles aren’t the kinds of coins you buy today, stock away for 20 years, and then sell to help pay for your children’s or grandchildren’s college tuition. These coins won’t necessarily appreciate in value over time. Rather, the best time to buy silver eagles is when the price of silver appears to have either hit bottom or is poised for an increase; the optimal time to sell American silver eagles is once silver prices look as though they’ve hit a plateau and may be coming down. During an active bullion market, some people may sell their American silver eagles only days – even hours – after buying them. Of course, nobody has a crystal ball as to what bullion prices will be later today, tomorrow, next week, or next year. So, as with any investment, you’ll need to gauge your purchase around what the markets appear to be doing, and bear in mind that the price of precious metals are influenced by several factors, including the crude oil market. Whenever you decide to purchase silver eagles, your best bet is to buy them from a coin dealer or bullion coin distributor. There are many American silver eagle distributors on the Internet, with Apmex and Monex being two of the leading silver eagle sellers in the bullion industry (note: I’m not affiliated in any way whatsoever with either of those businesses). Don’t let anybody make you think you need to buy the newest silver eagles for the “best” investment – newer is not really better in the American silver eagle industry. 1986 American silver eagles are the same in silver content and quality as silver eagles from this year. Also, unless you’re a coin collector, don’t spend your money on buying the high-priced “proof” American eagle silver coins (those “collector” pieces I referenced a little earlier). I’m a long-time numismatist and I love those beautiful proof silver eagle coins, but their steep price premiums make them impractical for bullion investors to profit from solely with gains in the silver market. 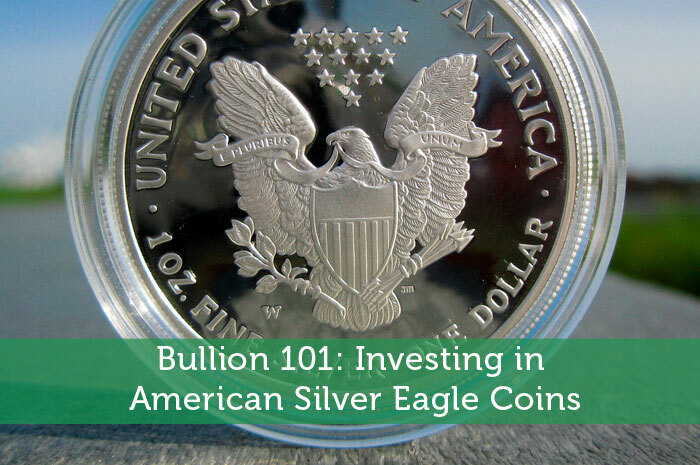 You can help maximize your investment potential with American silver eagles by including them in your IRA portfolio; a financial advisor can tell you more about how this may suit your unique investment circumstances. It’s important to note that any silver eagles you wish to use as IRA investments must be stored at an approved depository – which means you can’t keep IRA bullion in your home or bank safe deposit box. You also can’t put any bullion coins that you already own into an IRA. While there may be a few rules you’ll have to comply with when putting silver into an IRA, it could financially behoove you to add bullion to your IRA to help diversify your tax-sheltered portfolio, which can also include stocks, bonds, and mutual funds. Joshua McMorrow-Hernandez is a freelance blogger with more than 20 years of numismatic experience. He writes monthly features for COINage magazine and posts frequently about the coin market and bullion news on his blog at CoinValues.com. He and J$ (cointhrill) must be buds. I learned from this article. Glad I found this site. It’s really great and amazing post. Thanks for sharing. These coins are just gorgeous in my opinion. I’d be so worried about the silver tarnishing or something. Do you know the best way to protect these coins from that happening? I’d be more willing to have a little collection of these if I could keep them looking as shiny as the day I got them. Thanks for sharing this information on the American silver bullion coins. I had no idea that the price of these coins pretty much depends on the price of silver. You would think that older coins would be worth more than newer ones because they are more rare. It also sounds like you need to buy these coins only from a reputable coin seller so that you don’t accidentally get any counterfeit coins. My dad gave my twin sister and I our first collectible coins when we were little, and he gives us a new one each year on our birthday. I never though much about their value until recently. It’s so interesting how American bullion ratings change over time. You talk about buying coins for their value in silver, but isn’t there any value in their rarity? Thanks for the information on the value of American silver eagle coins. I thought they would be a great coin to put away to gain interest. I’ll be sure to check out the American bullion ratings to see how much they are worth per ounce. Great information. Thanks for the tips! I would like to invest in bullion, so knowing the best time to buy will help make my investment more worthwhile. It’s good to know that I should buy when the price of silver either hits bottom or is about to increase. You also pointed out that the best time to sell silver is when prices hit a plateau and about to decline, so I’ll be sure to remember that in case I want to sell my silver. I think that buying and investing in silver coins is a great idea. Like you mentioned, however, these coins will fluctuate in value as the price of silver ebbs and flows. But I’ve noticed that silver, for the past few years at least, has been going up in price pretty consistently making coins like this a great option for long term investors. Do you feel that silver will continue to increase in price like it has over the past few years?